An example of how allowing new shoots to grow at the margins of a pruning cut help it heal over quicker. 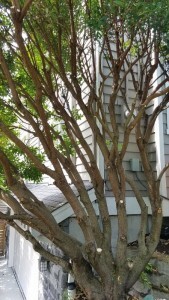 Ideally large cuts like this would never have to be made, but sometimes we don’t get around to pruning when we should. You can see the side that has the new shoots is healing over much quicker than the other side without any growth. This is on a large apple tree. After a few years the shoots are usually thinned to one or two of the strongest. This Arbutus unedo, or Strawberry Tree, had been hedged years ago. The client wanted it to look more like a tree. Hedging creates lots of new growth points in the upper canopy, and generally trees have fewer growth points. By leaving the leaders that were well attached and growing in the directions I wanted, while removing leaders in crowded areas of the canopy, I was able to get a good start on making it more tree like. 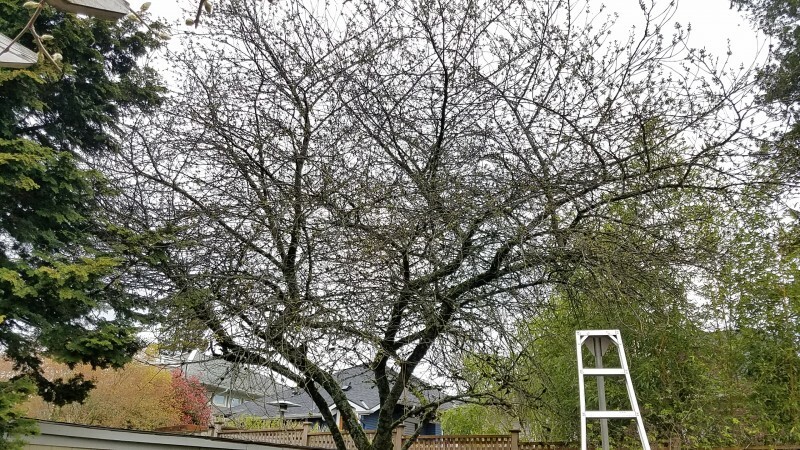 I started by removing a few lower larger diameter branches that seemed especially crowded, then focused on thinning the areas in the upper canopy that were topped in the past. 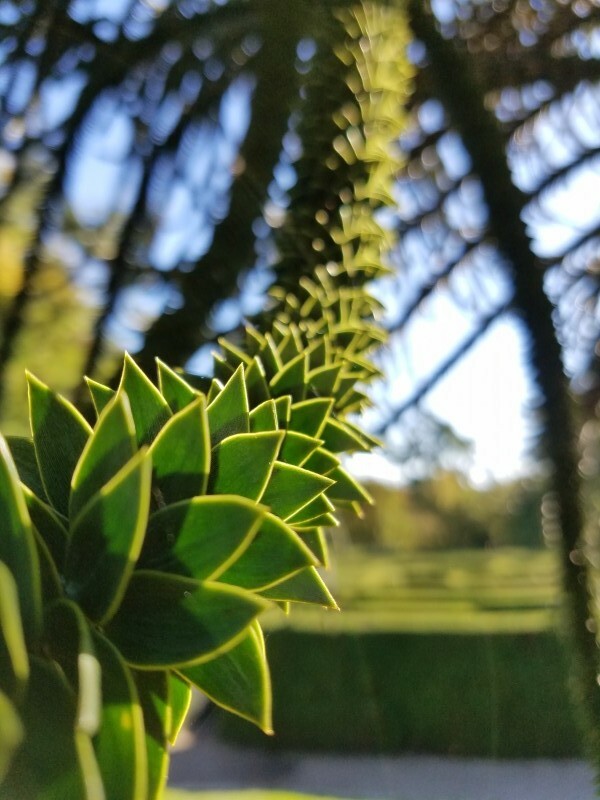 Did you know the seeds from monkey puzzle trees are edible? Latin name Araucaria araucana. I’ve been out collecting the fallen seeds around my neighborhood in Seattle a few times recently. Boiled for 5 to 10 minutes, and then cut open, they taste similar to a roasted chestnut. They are native to a small area in the Andes of central Chile and over the border into Western Argentina. The trees are usually diocecious, meaning there are separate male and female trees. 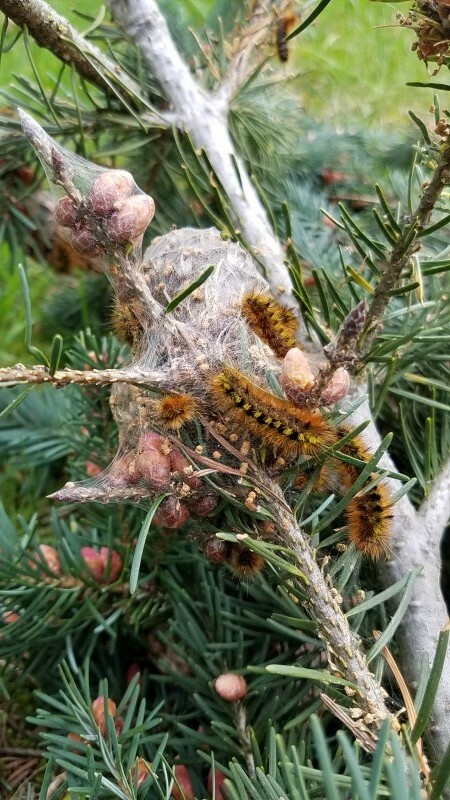 So if you see a tree with no seeds, it may be a male, or perhaps a female that is not within pollination range of other trees. A typical and healthy Monkey Puzzle tree (Araucaria araucana) in Seattle. 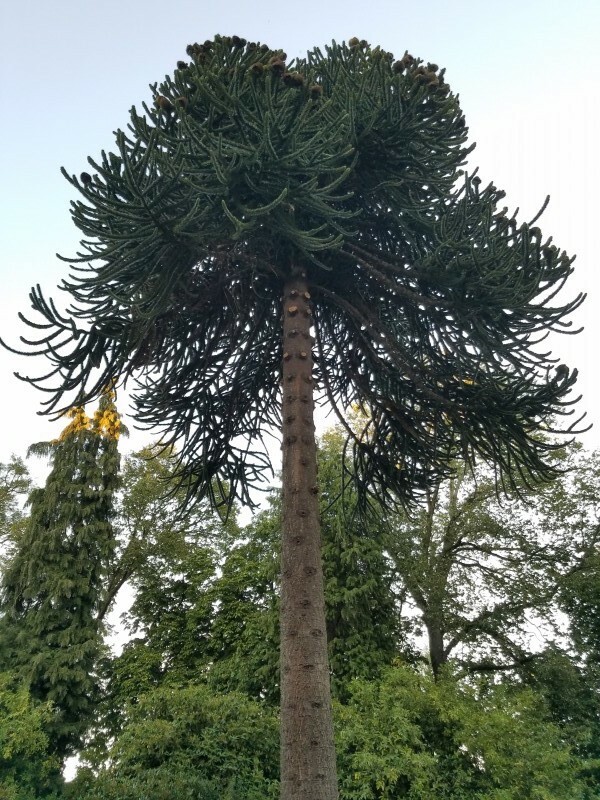 The spiky leaves would “puzzle a monkey” as to how to climb the tree. 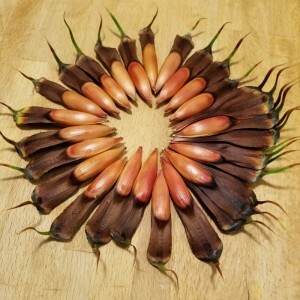 Individual seeds from the Araucaria. 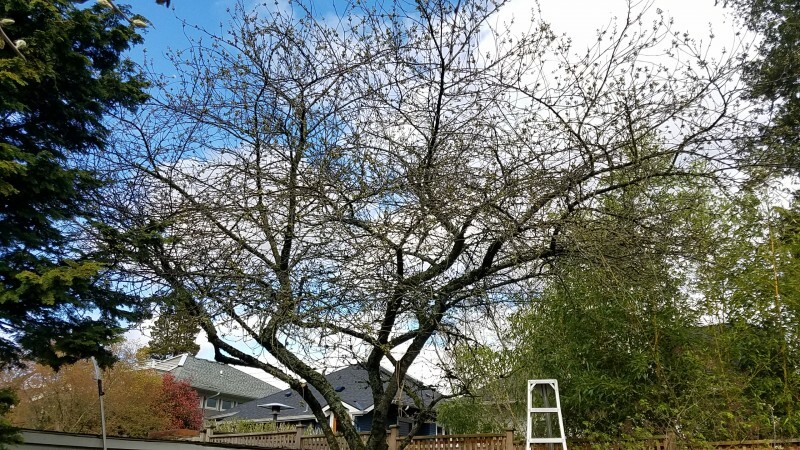 I wanted to share a couple photos of a cherry I pruned last week. 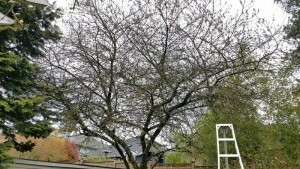 I started a multi-year process to create more healthy fruiting branches lower in the canopy where fruit can be reached. 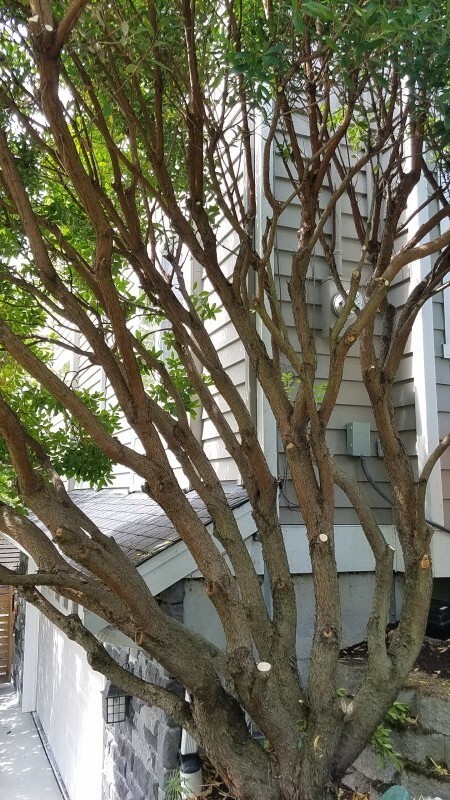 This first pruning in many years started by removing some of the highest more vertically-oriented branches in the upper canopy to create more light and airflow lower in the canopy. 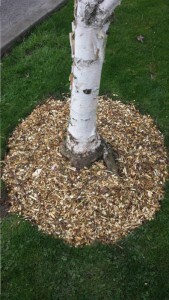 Thick areas were also thinned so the branches can dry out sooner after rains, which will help reduce fungal infections. 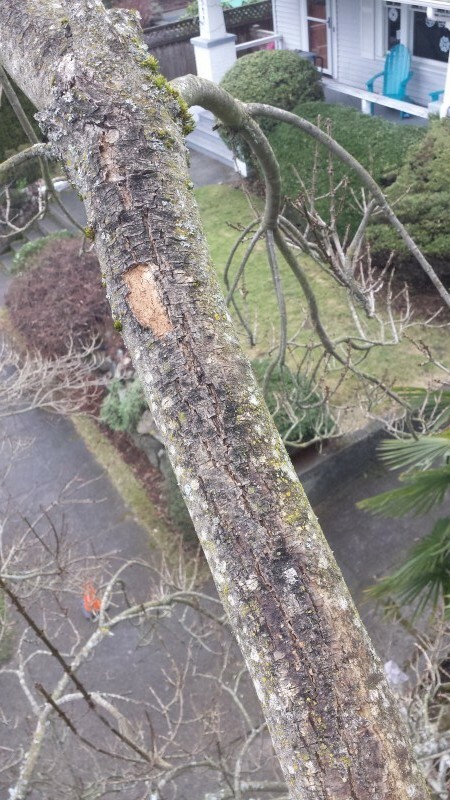 Many people say a sign of good pruning is that it’s not entirely obvious that pruning has occurred. If I may so myself, I think this is a good example. There’s an obvious difference between the before and after, but if one just saw the post pruning photo, it’s not obvious it’s been pruned. Lots of thick areas in the canopy, and several vertical shoots going nowhere but up. After thinning some of the thickest areas and reducing the height appropriately. When planting trees it’s important to remove all the soil that it comes with. Besides making sure you’re planting it at the correct depth (very important!) 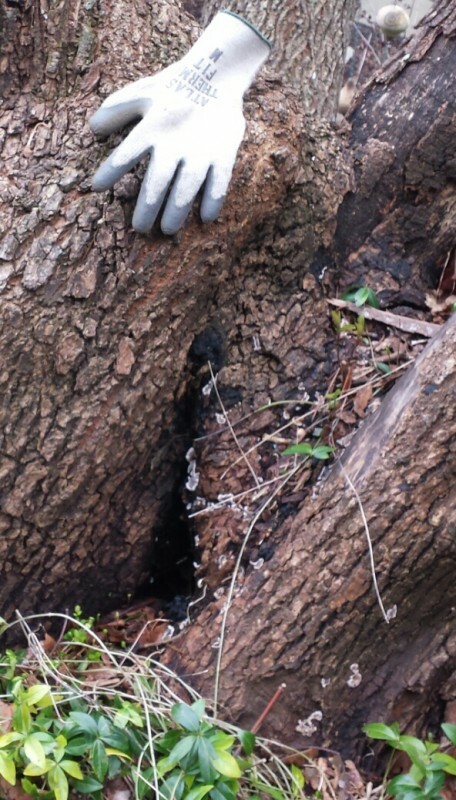 which is very hard to tell without removing the soil, you’re helping the tree get accustomed to its new home quicker. 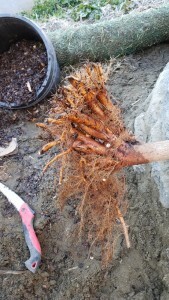 Often the soil it is grown in at the nursery is heavily amended to make the trees grow quicker. 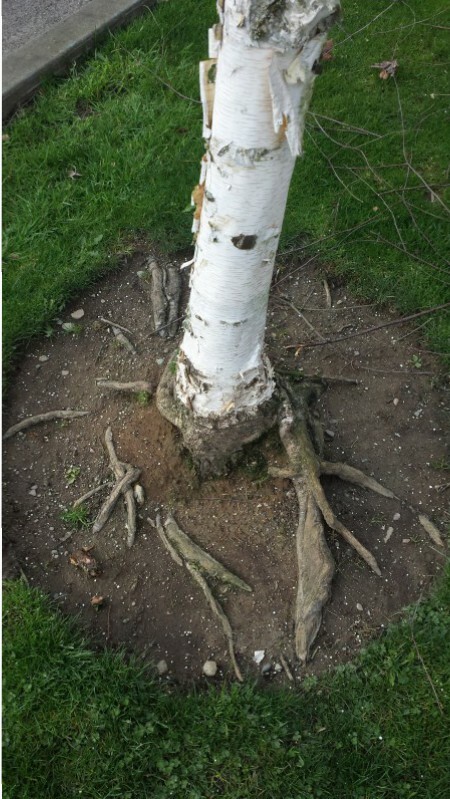 If this is left on the root ball of the tree when you plant it, and your soil is not as appealing to the tree, its roots may just hang out in this little zone for years without much exploratory growth outwards to create a strong and stable root system. It’s also important to look for and remove any girdling or circling roots and trim off broken or damaged ends. Poor planting often doesn’t show up for years, and may not become a problem until there’s a particularly strong windstorm, or a very dry summer, and those circling roots can’t hold the tree up or find sufficient water. 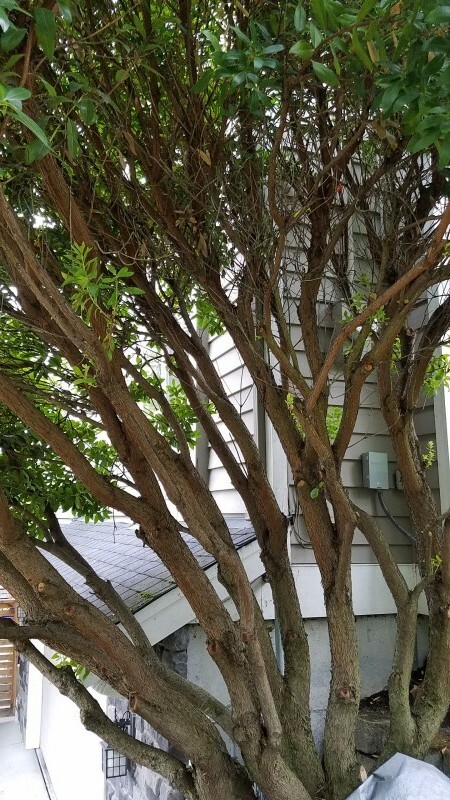 I removed a number of dead Arborvitae shrubs last month in North Seattle that died in the summer 2017 drought. It was very obvious that the only preparation to the tree was the burlap taken off their roots, and they were then just dropped into a hole. 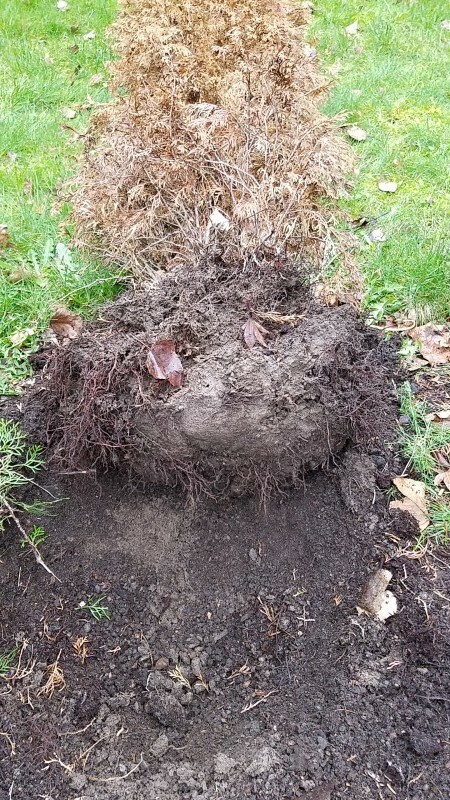 You can see the slick edge of the root ball from one of the dead arborvitae in the photo below, hardly any roots grew out of this packed soil into the native soil it was planted it. 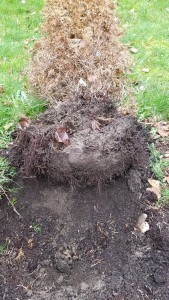 The slick edge of the rootball is still visible 3 years after transplanting. New roots had trouble growing through this into the native soil, eventually leading to its demise, as it couldn’t get enough water during a drought. 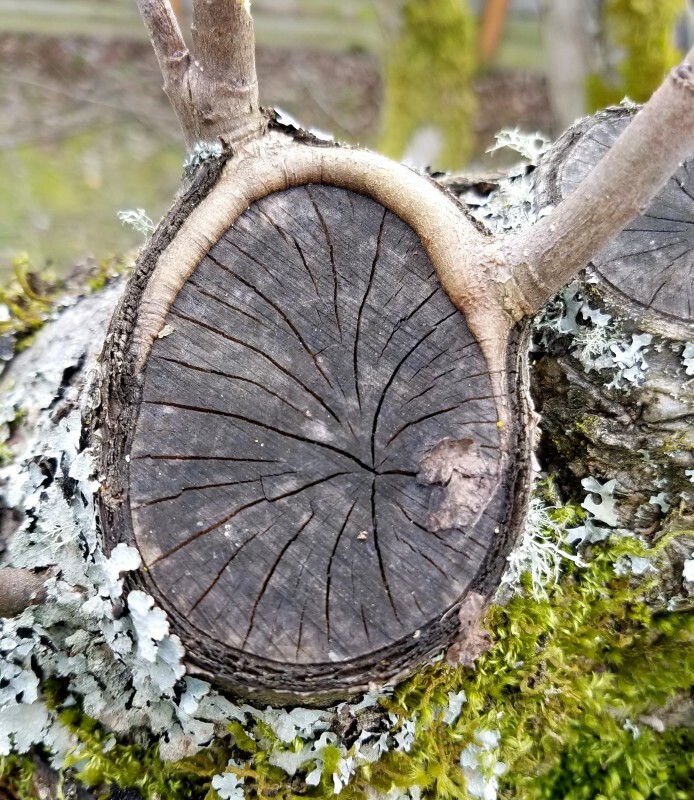 It may sound like some kind of monster, and in some ways it is, though normally it just appears as in innocuous fungus at the base of hardwood trees. 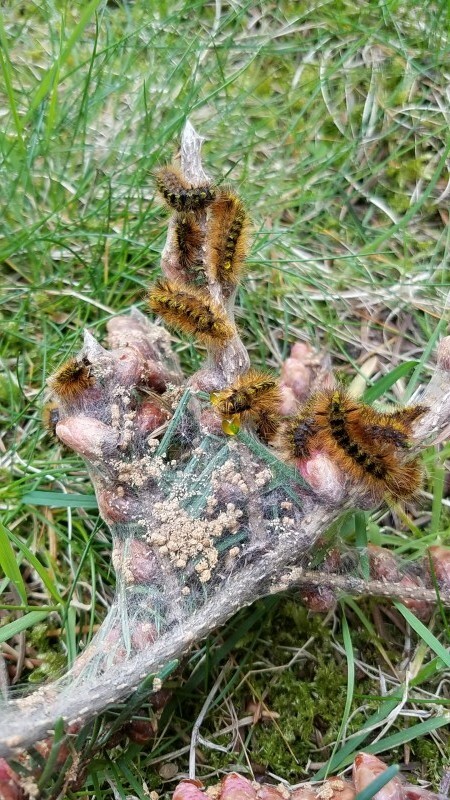 It’s a fungus called Kretzschmaria deusta found in temperate climates worldwide that can cause fairly severe decay. It has two visual forms. In the spring it grows new fruiting bodies that are gray with white edges that emerge directly at the base of trees and logs that are infected. Later in the year these turn into black crusty lumps that look like charcoal blisters. Both forms can be seen on a Big Leaf Maple in the photos below that I took during the spring in South Seattle. Both forms can be seen in this photo. The new gray and white growths, and prior years black coal looking lumps. 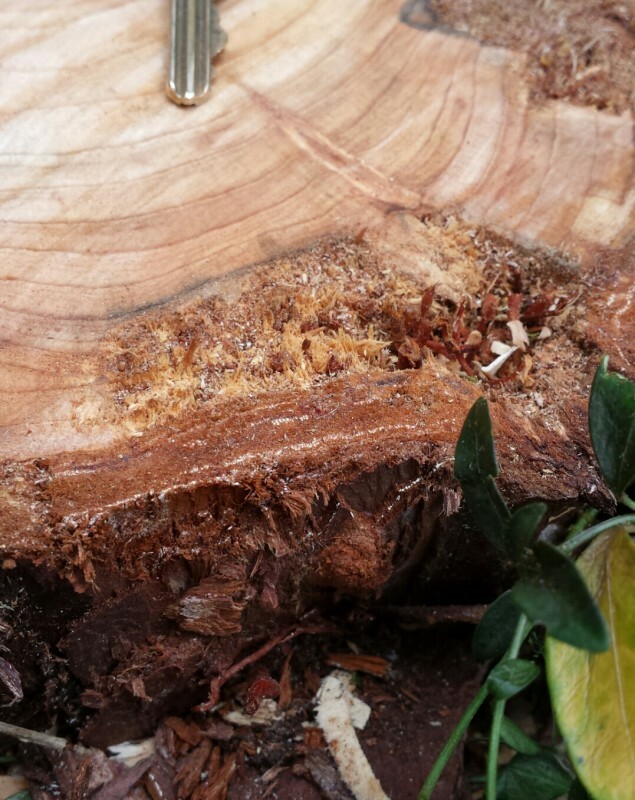 The fungus is a decayer of both cellulose (the fibers that add flexibility) and lignin (which give rigidity to wood). Thus it can be a fairly damaging fungus. 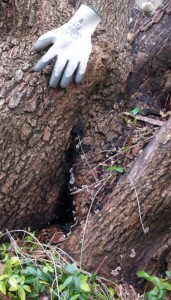 A glove for size comparison. K. deusta can be damaging to trees, usually indicating some significant decay. Any sightings should noted and investigated further. I came across something interesting last week while removing a small cypress tree in the Madison Valley of Seattle. The tree had a lot of recent branch and foliage die-back and generally was not looking robust. When I made the final cut low on the trunk I noticed a fair amount of decay (notice the spongy looking parts of the trunk in the photo on the left). 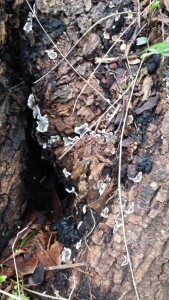 What I found interesting were the narrow bands of white fungal mycelium that were visible in the bark. They seemed to be only in the areas directly adjacent to the sections of rot further in the trunk. 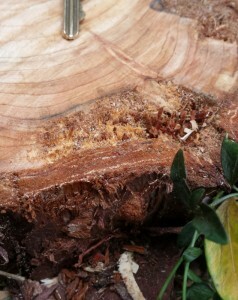 Perhaps the fungus decaying the wood is also visible in the otherwise healthy looking outer bark? I think a very close look at the bark layers (without removing the tree or even damaging the trunk) would have indicated the internal decay. Something I made a note of in case I come across a similar looking cypress tree in the future. To know if the two observations are actually correlated one would have to identify the fungal species, likely quite difficult since it wasn’t fruiting. 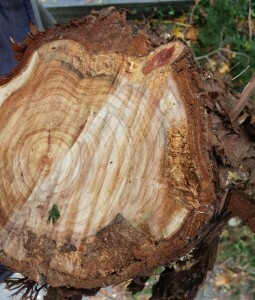 This tree had limited areas of healthy xylem and cambium, some of which can be seen in the upper left side of the trunk. 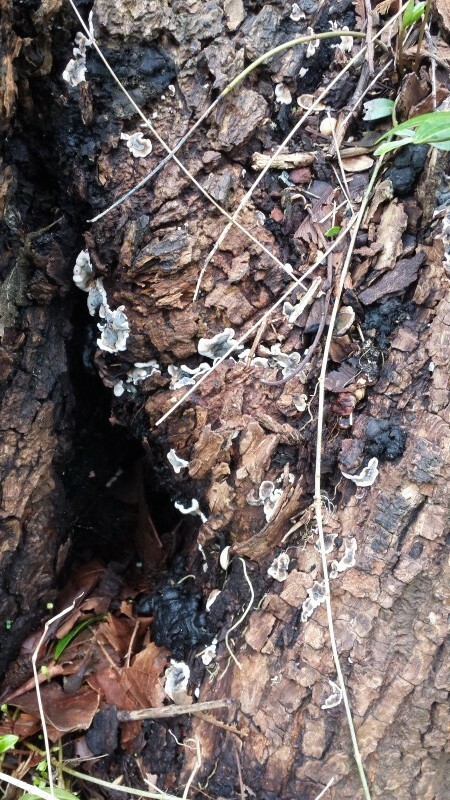 Note the bands of mycelium in the outer layers of bark.